Presented by Nonsequitur, supported in part by 4Culture. This work-in-progress presentation features dialog with the audience after each performance. 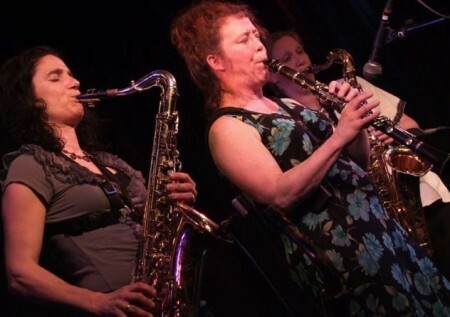 Seattle’s omni-musical treasure Amy Denio collaborates with the Tiptons Saxophone Quartet & Drums, Coast Salish storyteller and Native American flutist Paul “Che oke ten” Wagner, visual artist Aric Mayer, and director Lisa Halpern. This award-winning creative team has recorded and transcribed the oral histories of ten people from all walks of life, weaving these texts together into a rich tapestry of songs and images, based on these personal stories and myths they share. It will presented with humor and pathos, and propelled by musical and visual virtuosity. These histories ~ revelations, challenges and learnings ~ come from an ex-Army Ranger; a refugee from Kurdistan, Iran; a woman living with MS for 30 years; a semi-retired insurance agent, a hoarder who the day we connected received news her cancer has come back; an adoptee who has a brain tumor removed (but not her sense of humor), plus stories from the wealth of local NW Salish Sea tribal knowledge.